Sedap was a Malaysian restaurant on Old Street. According to Google Street View, it closed down by October 2016. 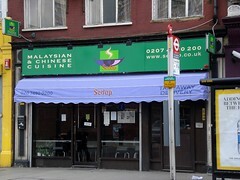 Malaysian restaurant on Old Street, near the junction with Whitecross Street. It opened in Spring 2009 on the old location of Yat San, and it's the new home of the chefs from now-closed Nyonya in Notting Hill. In style, it's a little like a smart cafe, with an all-glass frontage, pale hardwood floor, and black tables and chairs (bellaphon's review, linked below, has some interior photos). The front part seats about 30 if that, but if they're busy they may also open the back room, where there's more seating. They also offer takeaway and delivery. Kake first visited late on a Monday lunchtime in April 2009. There were a few other customers just finishing up their lunches when I arrived, but by 2pm everyone else had gone back to their offices and I was on my own. I decided to go for their lunch special offer; £5.65 for one of three starters plus a main. The waiter helpfully went through the menu with me and explained that they have separate vegetarian versions of some of the dishes, and that some of the cheaper mains come with two starters instead of one in the lunch offer. I started with the kerabu vegetable salad photo, which was really fantastic — slivers of cucumber in a sweet-and-sour lime-mint dressing, with a few bits of cloud ear fungus for colour and a small chilli kick at the finish. My main was sambal brinjal photo; this was again full of flavour, with just the right amount of prawn and chilli in the sambal and a melting texture to the aubergine. My only criticisms would be that the aubergine skin was a little tough (though this may be the necessary price for the texture of the centre), and the accompanying rice was very slightly undercooked for my taste (though this is a personal preference, and I was happy with the rice on our later visit). Kake, Ewan, Laura, and bellaphon visited again on a Monday evening in January 2010. When we arrived around 6:30pm there were no other customers, though a couple of other parties had arrived by the time we left. We had the kerabu salad again (£3.80); the balance of flavours in this was perhaps a little less enthralling than when Kake tried it previously, but it was still good overall. Roti canai (£5.50 for a small bowl of curry plus one roti, extra roti at £1.80 apiece) was good, with nicely flaky bread and a lamb curry accompaniment that wasn't quite as overwhelmingly oily as it looked photo. Char kway teow (£7) photo, beef rendang (£6.90) photo, tow yu bak (braised belly pork; £6.50) photo, and sambal okra (£5) photo were all generally approved of too, with particular praise for the tenderness of the pork, though bellaphon felt the portions were a little small. Kake's verdict: I've been twice now and would happily come back. Last visited by Kake, Ewan, Laura, and bellaphon, January 2010. Last edited 2018-10-05 10:41:53 (version 21; diff). List all versions. Page last edited 2018-10-05 10:41:53 (version 21).